If the Internet Movie Database says that The General opened at the end of 1926 and belongs to that year instead of its often-cited release year of 1927, who am I to argue? It gives us a towering #1 for the year, whereas The General would need to play second fiddle to Sunrise in a 1927 accounting. 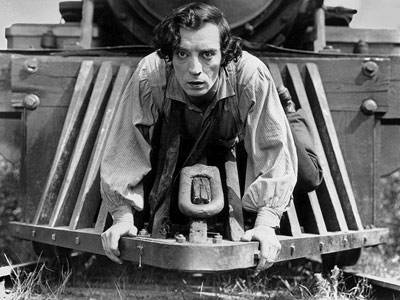 Buster Keaton’s most acclaimed feature looks as though it might have been made much earlier – not because of a lack of sophistication, but because the sets, costumes, and locations are convincingly tuned to the Civil War. It’s all so marvelously balanced, the comedy, suspense, romance, historiana; balanced like a man sitting on a locomotive gear that slowly begins to move. The last one sneaks in because of its zany Expressionist approach to psychoanalysis; not a great movie, but a great look at what ambitious movie-makers were interested in trying out. It nips out some very enjoyable star vehicles: Son of the Sheik (Valentino), The Black Pirate (Fairbanks), The Temptress (Garbo). There’s much more of 1926 I have yet to see, but the #1 should be solid. The General and Bringing Up Baby are my two favorite comedies of all time. The General is also a great introduction to silent film for the uninitiated. It’s hard to hit all the key titles in those remote silent years; myself, I’ve yet to see Secrets of a Soul and The Holy Mountain … even though the latter has been lurking in my foreign-films DVD cupboard for several years. But by all means make a point of catching Three Bad Men, Ford’s final silent Western and by consensus his best (oddly enough, he didn’t return to that genre for 13 years–something in the overland vehicle subgenre). And Raoul Walsh’s robust original screen version of What Price Glory (way superior to the Ford redo; pity there’ll probably never be a Walsh at Fox box). And Exit Smiling, a delightful comedy whose rediscovery led Andrew Sarris to hail Beatrice Lillie, on the basis of one performance, as the silent-comedic equal of Keaton, Chaplin, et al. (and she’s almost–almost–pretty!). However, as you say, number one for 1926 is solid. Richard, a mutual friend gave me some un-packaged silent Ford discs because he’d received the big Ford at Fox package, but – alas – Three Bad Men wasn’t one of them. (So you see it’s HIS fault I haven’t seen it yet, not mine.) Looking forward to it, though. I second R. T. Jameson’s suggestion of What Price Glory. I saw it many years ago at the Granada Organ Loft in West Seattle (Too bad that place got wasted.). It’s very kinetic! And Walsh really know how to put it together. The others on Jameson’s list I have not seen. Something was going on in the 1920s.